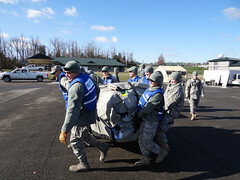 GREENVILLE, Ky. — More than 40 members of a Kentucky Air National Guard disaster-response team deployed to the Wendell H. Ford Regional Training Center here recently, joining forces with Kentucky Army Guard Soldiers to participate in their first field-training exercise. The Guardsmen collectively formed a Chemical, biological, radiological, nuclear or high-yield explosive Enhanced Response Force Package, or CERFP for short, said 2nd Lt. Jessica Ellis, medical operations officer. A CERFP is comprised of medical personnel, a search-and-recovery team, a decontamination team and a command-and-control element. Their mission is to provide immediate response capability to the governor of a state affected by an attack, searching an incident site, rescuing and decontaminating casualties, and performing medical treatment to stabilize them for transport to a medical facility. The exercise, which took place Nov. 28 to Dec. 4, allowed personnel to become more familiar with the equipment they will use in a real-world disaster-response situation, Ellis said. Various exercise scenarios also gave the Air Guard troops an opportunity to perform their duties in a structured learning environment while working with the decontamination team, which is comprised entirely of Army Guard personnel. According to Ellis, the event was held in preparation for a larger exercise scheduled for May, when the Kentucky CERFP will be required to demonstrate its ability to manage a coordinated response to a simulated attack involving chemical, biological, radiological, nuclear or high-yield explosive agents. 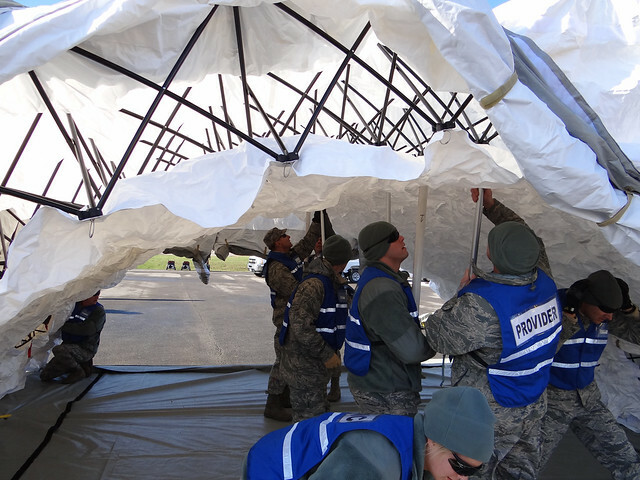 The first day of training was focused on equipment familiarization, such as assembling and breaking down tents, coordinating with the Army decontamination unit, organizing teams and preparing medical supplies. The remainder of the time was spent practicing scenarios in which the CERFP was activated by an incident commander. Participants were tasked with securing the site of an attack; and coordinating the movement of search-and-recovery teams, the decontamination team and the medical unit. “This was the first time we’ve really gotten together in the field as a team, and for most people it was the first time they had seen the equipment,” Ellis said. “We’ve all read the Concept of Operations and know our mission, but when you’re actually setting up the equipment and doing the mission, you discover better ways of doing things and things you need to adjust,” she added. The highlight of the exercise was the final scenario, during which the unit met all of its training evaluation timelines while processing patients and communicating movement through command-and-control channels, Ellis said. “At the end of the week, all of the new members who took part in their first CERFP exercise were able to completely set up the medical portion of the team and were ‘patient-ready’ after just 29 minutes,” said Maj. Brian McMorrow, the CERFP’s medical plans and operations officer. That’s more than an hour sooner than required by exercise evaluation standards, he noted. McMorrow attributes the team’s success to the attitudes of its members.